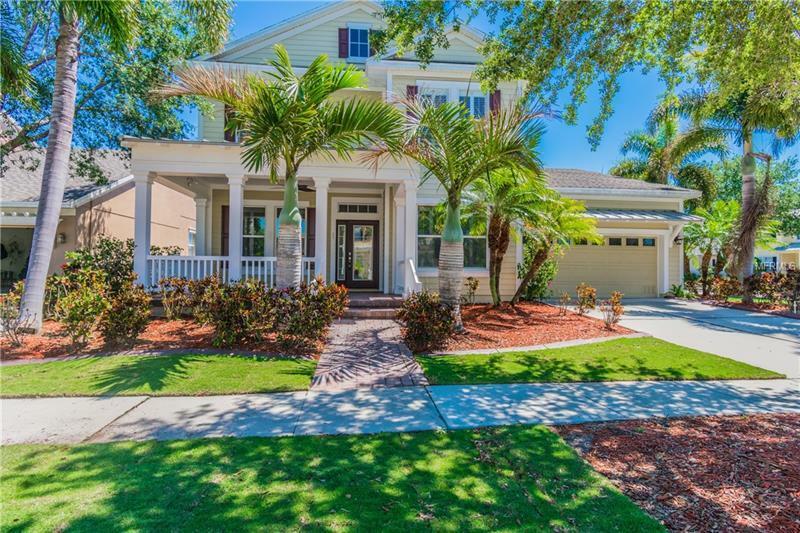 Enjoy the relaxed coastal living feel of the beautiful community of Mirabay in this Key West-style, four-bedroom home on a corner lot. As you arrive, the large front porch welcomes you home. This home offers a great floor plan with a downstairs master suite, formal dining room, office/bonus room, living room and kitchen. The soaring ceiling in the living room is accented by a beautiful Palisade double ceiling fan. The nicely appointed kitchen with gleaming granite countertops, solid wood cabinets and a gas range. A full pantry and eat-in breakfast nook complete this wonderful kitchen. Upstairs you will find three additional bedrooms and a full bath with granite countertops. Enjoy many upgrades such as fresh paint, new carpet, soft close kitchen cabinet doors, crown molding, built-ins and more throughout the home. Enjoy outside living on a spacious screened in porch overlooking the large, private backyard. The two-car garage has a large amount of built-in storage as well as a tasteful epoxy low skid coating. The community offers many wonderful amenities, such as an Olympic size heated pool with room for laps, as well as a slide, play area and a zero entry side. Some of the other amenities include a cafe, fitness center, sand volleyball court, tennis courts, basketball courts, playgrounds, game field, community boat ramp, community dock and more! Mirabay is centrally located for an easy commute on I-75 or US 41 to Tampa, Sarasota or St. Petersburg. Pet Restrictions: Total of 4 pets that add up to no more than 175 lbs. Pitbulls are allowed for owners only. SEE HOA RESTRICTIONS.